Successfully Added Huawei AM08 Little Swan Portable Bluetooth Speaker - 360-Degree Surround Sound, Hands-Free Calls, 700mAh, 10m Bluetooth Range to your Shopping Cart. The Huawei AM08 Little Swan wireless Bluetooth speaker features an elegant design and delivers impressive sound quality, making it the perfect electronic gadget for all music lovers out there that are looking for a stylish speaker to spice up their interior. Besides being a great asset to any modern household, this beautiful Bluetooth speaker is highly portable, allowing you to carry it along wherever you go. Whether you’re at home, in the park, or at the beach – with this portable speaker you’ll always be able to listen to your favorite tracks in style. Featuring Bluetooth 4.0 connectivity, this wireless speaker supports ultra-fast transfer speeds. Simply pair the speaker with your smartphone, tablet, or laptop, and you’ll be able to listen to those all-time classics without experiencing any lag or delay. Its 360-degree surround sound effect delivers a stunning audio experience to anybody in your near surrounding, ensuring that no matter where you’re seated, you’ll always be able to enjoy the latest songs in truly audiophile-grade quality. Packing a sophisticated 700mAh rechargeable battery, this portable Bluetooth speaker is capable of blasting away those songs for 4 hours continuously - enough to get through a fun filled afternoon without needing to worry about battery life. Its strong 10-meter Bluetooth range brings along great mobility – allowing you to move through the house with your phone at your side without interrupting the audio signal. When paired with your mobile phone, this Bluetooth portable speaker furthermore allows you to engage in hands-free phone calls. From now on you’ll never need to have your phone at hand again as, with the simple press of a button, this beautiful wireless speaker allows you to instantly answer any incoming call. 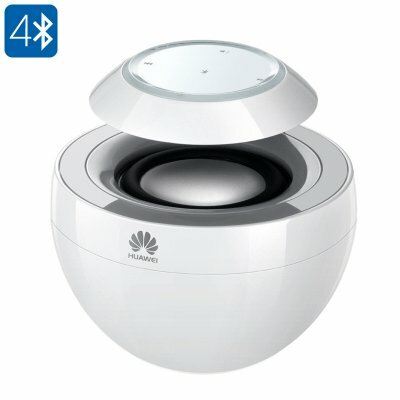 Thanks to its stylish and highly portable design, the Little Swan Bluetooth speaker from Huawei is the perfect electronic gadget for all music lovers out there. Whether you use it to spice up your interior or to listen to your favorite songs on the go – this wireless speaker will never let you down. The Huawei AM08 Little Swan portable Bluetooth speaker comes with a 12 months warranty, brought to you by the leader in electronic devices as well as wholesale electronic gadgets..